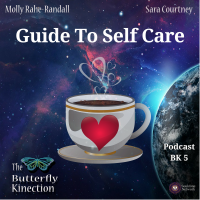 Molly and Sara discuss the importance of self care and the things we can do physically, emotionally, and spiritually to achieve self care. When we start to take care of ourselves, the things that normally feel like stressors can become joyful again, such as our relationships with others. Having a balance and carving out time on a daily basis to take care of our physical body, our minds, and our spirit allows us to find our joy again. Molly and Sara remind us that we are all important and are worth it. And, honoring our spiritual connection to Source is also an important part of self-care. Molly and Sara offer a list of ways to take care of ourselves spiritually. At 17:26, they discuss how to clear our energy and our living space using a process called smudging. They offer a guide to smudging video on their website. At 22:02, they give a detailed example on how to ground yourself. Check out the Guide to Self Care guided journaling exercise . DISCLAIMER- This podcast pro­vides gen­eral infor­ma­tion, opinions, and dis­cus­sion about med­i­cine, health and related sub­jects. The words and other con­tent pro­vided in this podcast, and in any linked mate­ri­als, are not intended and should not be con­strued as med­ical advice. If the listener or any other per­son has a med­ical con­cern, he or she should con­sult with an appropriately-licensed physi­cian or other health care worker. The views expressed in this podcast and web­site have no rela­tion to those of any academic, hospital, practice or other insti­tu­tion with which the authors are affiliated.